This article was originally posted on Bitcoinist - one of the leading sources for information about Bitcoin, digital currency and blockchain technology. With one of the most reliable news teams in the industry, Bitcoinist provides up-to-date news and insightful analysis. For more follow the link below. Binance delisting Bitcoin SV (BSV) is forcing other exchanges like Kraken and Shapeshift to follow. Let’s take a look at the implications of this unprecedented move for the world’s biggest exchange. Yesterday, the biggest bitcoin exchange by volume, Binance, announced it would delist Bitcoin SV (BSV) in a stunning move. Citing the failure to meet high standards, CEO Changpeng ‘CZ’ Zhao pulled the plug on the altcoin claiming to be the ‘original’ Bitcoin. CZ first issued a warning last week after BSV financiers Craig Wright and Calvin Ayre threatened to sue a member of the Bitcoin community for libel. Finally, Binance dropped the bomb on Monday, which CZ said was “the right thing” to do. 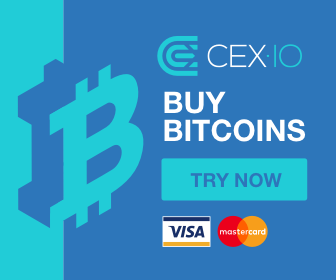 As Bitcoinist reported, last week, Morgan Creek cofounder Anthony Pompliano called on every major exchange to delist BSV “simultaneously” on May 1st. But with Binance pulling the trigger much earlier, other companies are already following suit. Blockchain announced it would drop support by May 15th. “After careful consideration, we have determined to end all support of BSV within the Blockchain Wallet by May 15, 2019,” they wrote. Shapeshift also jumped on the bandwagon delisting the altcoin much sooner. 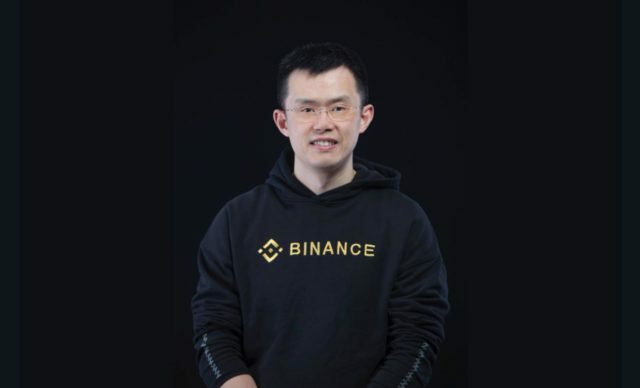 “We stand with Binance and CZ’s sentiments,” wrote CEO Erik Voorhees. We’ve decided to delist Bitcoin SV from Shapeshift within 48 hrs. Bitcoin exchange Kraken, meanwhile, revealed it’s also considering taking action. 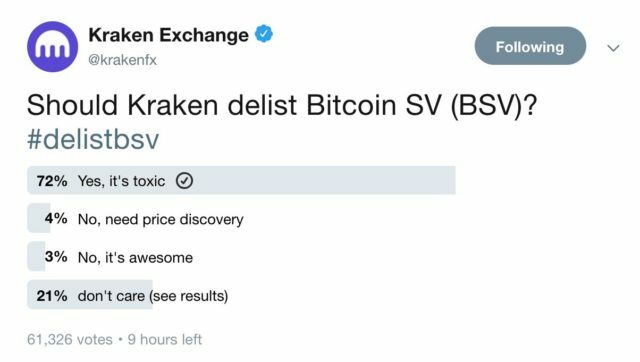 It posted a public poll asking whether BSV should be removed. Interestingly, Kraken may have even more reason to remove BSV. As Bitcoinist reported last December the exchange was sued by UnitedCorp over an alleged complot to hijack the Bitcoin Cash network following a highly contested hard-fork that spawned BSV. Ultimately, the decision to drop BSV could bring a slew of benefit for world’s biggest exchange for many reasons. First, BSV trading volume on the platform was negligible. With Binance supporting hundreds of altcoins, dropping such a low volume coin will not hurt their business. In fact, the number of actual BSV users is dwarfed even by its forked rival BCH. Its hashrate, despite courting miners, is a miniscule 1.6 percent of Bitcoin’s. Moreover, Bitcoin SV price 00 plunged immediately following the news by over 20 percent revealing its tenuous market presence. Second, the delisting gained Binance a lot of ‘street cred’ from the community. By removing a coin that was synonymous with lawsuits, fraud and ‘Faketoshi,’ the exchange sets a precedent of industry self-regulation. 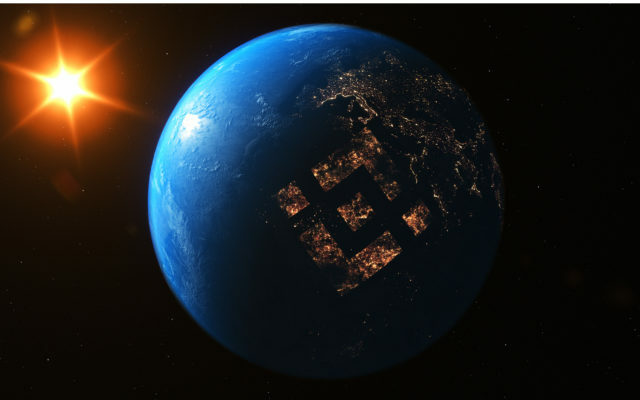 Third, it establishes Binance as the de facto leader among exchanges. By following through with his warning, the CEO demonstrated that he will defend his principles, like a true leader is expected to do. Fourth, BSV is now a pariah. This means that other exchanges who *do not* delist it moving forward will lose credibility in the eyes of the public, further strenghtening Binance’s position. It will also discourage exchanges from listing questionable Bitcoin-branded ‘forks’ in the future. JUST IN: @Gemini never listed $BSV in the first place. Will delisting BSV benefit Binance in the long run? Share your thoughts below! The post 4 Reasons Why Delisting BSV Was the ‘Right Thing to Do’ for Binance appeared first on Bitcoinist.com. To read more from Bitcoinist follow this link. News can be misleading. Trust us to pull together the best sources for you.